Navyblue has designed branding and packaging for distiller Gordon & MacPhail’s Mortlach 70-year-old Speyside single malt Scotch whisky, featuring an engraved, tear-shaped bottle. 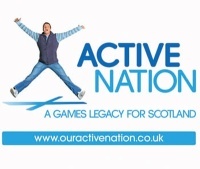 Tayburn has designed the logo for Scottish initiative Active Nation, which encourages people to exercise more. Among several generic characters used, a jeans-clad figure represents ’everyman’.